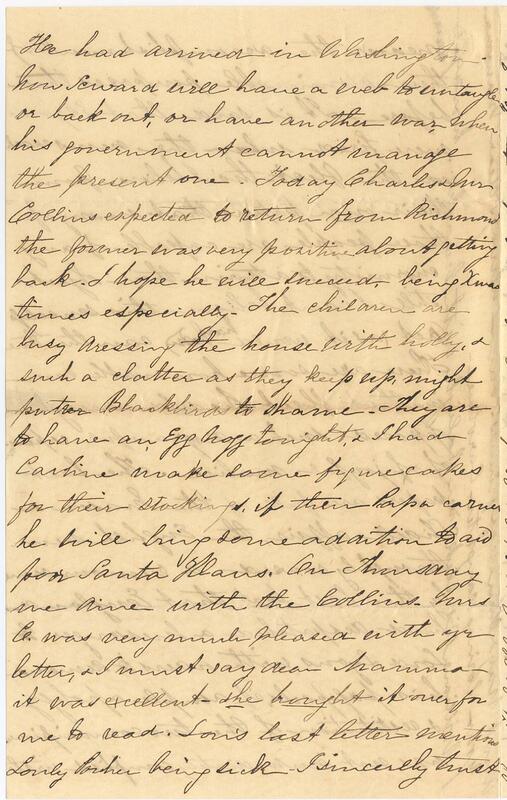 Item description: Letter from Jane Caroline North Pettigrew to her mother, 24 December 1861. Item citation: from folder 249 in Pettigrew Family Papers #592, Southern Historical Collection, Wilson Library, University of North Carolina at Chapel Hill. Your last letter was so desponding that I scarcely know how to write to you since the great calamity of the conflagration. This is indeed a present evil, one we must personally feel & mourn. It is I fear to dear Uncle almost overwhelming – of him beyond the fact his house being burnt down. I know nothing. was anything saved? 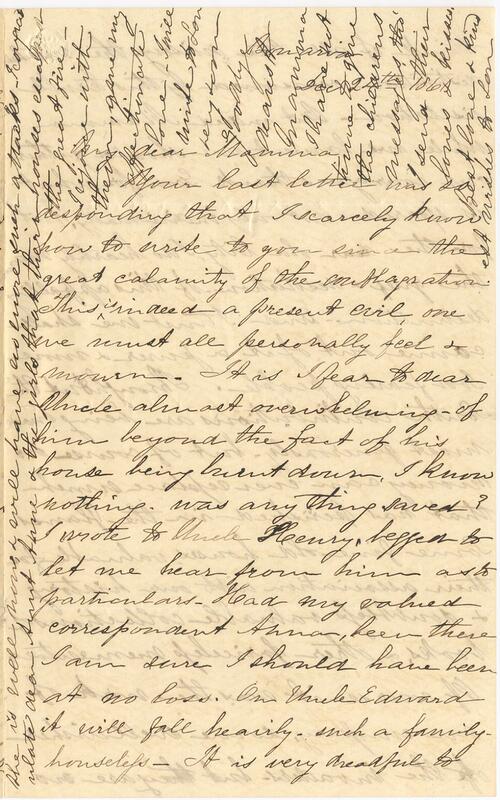 I wrote to Uncle Henry, beggin to be let me hear from him as to particulars – Had my valued correspondent Anna, been there, I am sure I should have been at no loss. On Uncle Edward it will fall heavily – such a family houseless – It is very dreadful to think of all the misery – the wretched destitution occasioned by this terrible visitation. But indeed Mamma while we lament, we should gather our courage and thank God for what is spared, not only individually but for the dear old city. I do heartily mourn the grief & desolation of this appalling destruction. and I trust one shall come out of it a pure & more God fearing people. 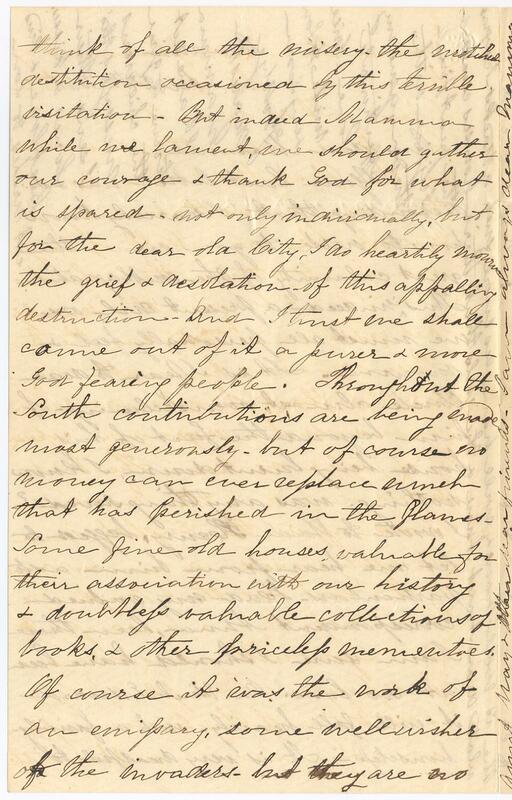 Throughout the South contributions are being made most generously – but of course no money can ever replace ___ that has perished in the flames – Some fine old houses valuable for their association with our history & doubtless valuable collections of books, & other priceless mementoes. Of course it was the work of an emissary, some well wisher of the invaders – but they are no nearer the accomplishment of their abominable purposes than before. It is said that 30 guns were fired, when news reached the fleet – tho I believe from their own papers that many of those people are capable of any enormity to attain their objects – still I can’t believe this senseless act (as it would have been) can the true. There are some honorable men in that fleet, who would surely have opposed such a disgraceful expression of joyful malice. The last papers are full of the Mason & Slidell affair, the English seem thoroughly roused. A rumour came by the last boat that England had dispatched a messenger to Lord Lyons with orders to demand his passports, if ample apology & restitution of the two commissioners was not immediately complied with. William is stuck in Raleigh with the measles. 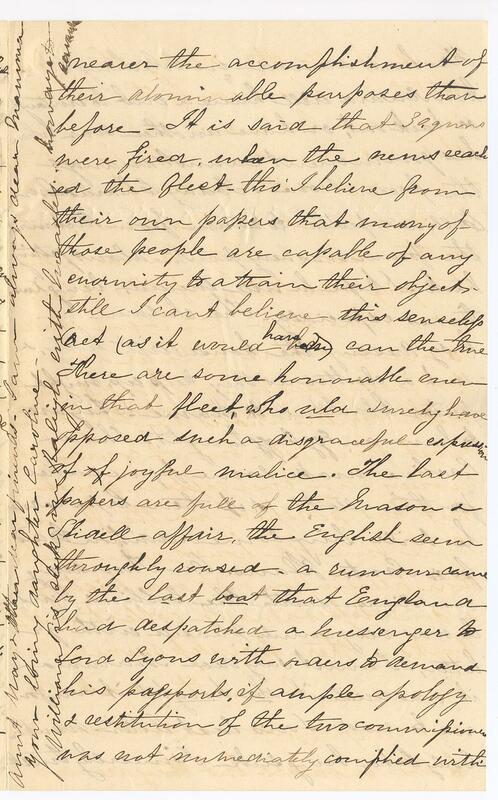 This entry was posted in Southern Historical Collection and tagged Charleston, Charleston fire, Christmas, measles, Pettigrew family, South Carolina. Bookmark the permalink.